My University organises a faculty-wide Societal Engagement Day, which aims to familiarise scientists with different forms of societal engagement. Based on my dissertation (and my concept of value work), I will give a workshop titled ‘Engaging with the Good: valorisation as ethical practice’. See below for an abstract. The day is open to all Maastricht University related researchers (register here). As it happens, in the past months I have been enrolled in a course about valorisation. It’s a course organised by Brightlands and Maastricht University and includes early-career scholars from all faculties. It’s fun and informative to meet academics from all walks of science, and discuss how to make our work relevant. At the same time, I noticed that (up until now) the dominant view on valorisation practices there is a utilitarian or economic one. So I decided to turn my ethical approach to valorisation – value work – into a marketable form of knowledge utilisation. 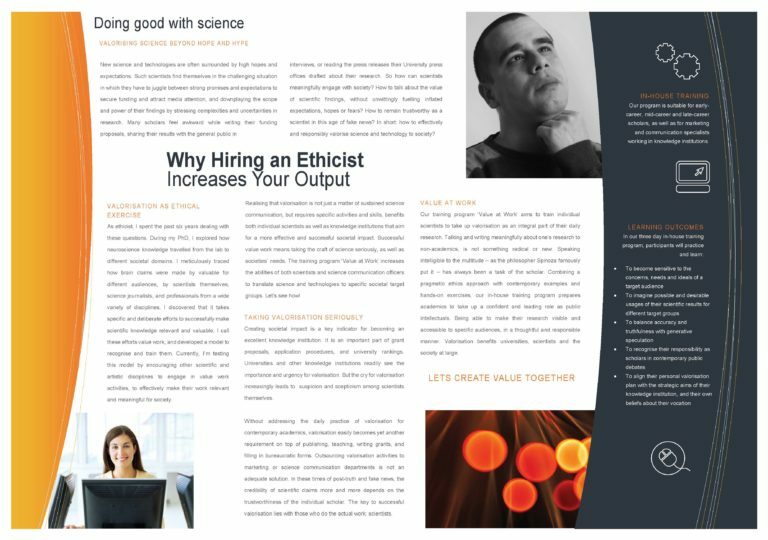 In an exercise, I ironically used the corporate, slick form of the consultancy to sell my (very serious idea) of valorisation as an ethical practice – including the horrible design and cheesy stock photos. See below, after the abstract, a snapshot of the fake flyer I managed to photoshop (long live the interwebs with all its free templates!). How to talk intelligible to different audiences about your research? How to manoeuvre between the seducing promises in press releases, and the high expectations of science journalists and other science translators? In this workshop, dr. Ties van de Werff offers some tools and suggestions for responsible knowledge valorisation. Based on his dissertation, where Ties showed how neuroscientists make their knowledge valuable for different audiences, he develops a model of valorisation as ethical practice. Ties argues that valorisation should not be reduced to mere economic knowledge utilisation, but rather should be seen as a task of the scholar as public intellectual. Valorisation of scientific knowledge requires an ethical sensitivity to the different concerns and ideals of the audiences we aim to talk to. When articulating and balancing different societal values, scientists engage in so called value work. By explication this value work, we can cultivate a better understanding of what it actually takes to valorise scientific knowledge.